Weâ€™re located in part of the Pfefferberg industrial monument. 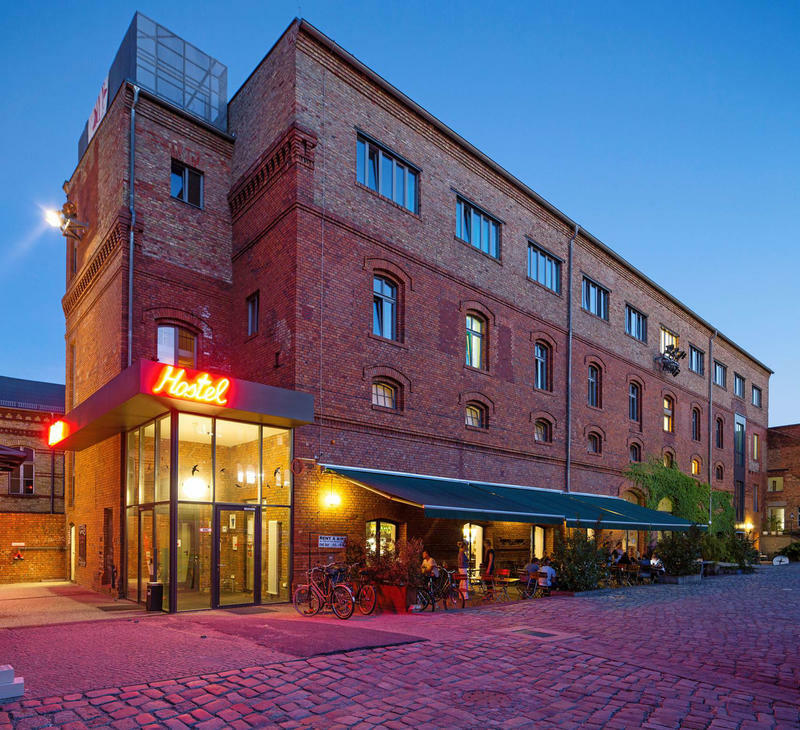 This former brewery, which was built in the mid-nineteenth century, is now a one-of-a-kind cultural centre. 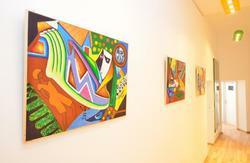 Here you can explore galleries, artist's studios, clubs and restaurants. Right on our doorstep! Our hostel has some impressive architecture. It combines nineteenth-century industrial architecture on the outside with stylish design on the inside. The lobby has brick-vaulted ceilings, organic forms, a huge light installation and an open fireplace. Our dorms have impressive brick-vaulted ceilings and each bed has its own locker, reading light and power socket. Our double and single rooms feature exclusively designed furniture plus TV and Internet access. All the rooms have freshly-made-up beds and are cleaned daily. The dorms have lockable storage facilities. The all-you-can-eat breakfast buffet is just â‚¬6.50, plus you can get some tasty snacks and meals throughout the day. The CITY TAX is not included in the bed price. Thereâ€™s so much to do around here â€“ weâ€™ve got a 24hr bar, a pool table, table football, table tennis and more, plus free Internet terminals and Wi-Fi. If itâ€™s cold you can hang out by the open fireplace and if itâ€™s sunny you can relax on the terrace or in our lovely garden. We have free city maps and free walking tours, or you can borrow a travel guide from our book exchange. Reception is open 24hrs, with luggage storage, washing machines, towel rental and bike rental for just â‚¬10 per day. You can also borrow hairdryers, irons, phone chargers and power adapters. Prenzlauer Berg is Berlin's 'in' district in central Berlin. Apart from its many shops, cafÃ©s and galleries, Prenzlauer Berg has an unequalled nightlife to be experienced in its countless bars and clubs. Major sights are within walking distance; Hackesche Hoefe is 15 minutes away and the Museum Island and Alexanderplatz are a 20-minute walk. 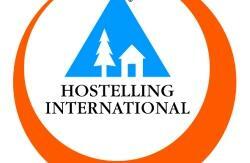 Our hostel is a non-profit organization which promotes integration and provides jobs for disabled people. 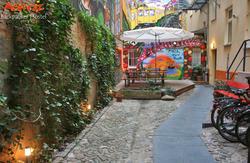 Pfefferbett Hostel - experience the real Berlin! Please make sure you read our Things to Note below before booking. Please note: from 1. January 2014, the City of Berlin is collecting a â€žCityTaxâ€œ amounting to 5% of the accommodation rate. We are forced to collect the tax and to pass it on to the City of Berlin. Business travelers are excluded from the tax, if they can verify this fact. The tax must be paid by the traveler locally. Here you can find some more information. Take the TXL bus to Alexanderplatz. Change to the U2 subway line in the Pankow direction. Get out at Senefelderplatz (two stops) and take the SaarbrÃ¼cker StraÃŸe exit. Cross the street and climb the stairs to Pfefferberg (SchÃ¶nhauser Allee 176). Once inside, go through the beer garden and head left. You'll find us in courtyard 4, building 6. Take the Airport Express (RE 7, direction: Belzig, 7.25h, 8.25h, 9,25h... or RB 14, direction: Nauen, 7.55h, 8.55h, 9.55h...) to Alexanderplatz. Change to the U2 subway line in the Pankow direction. Get out at Senefelderplatz (two stops) and take the SaarbrÃ¼cker StraÃŸe exit. Cross the street and climb the stairs to Pfefferberg (SchÃ¶nhauser Allee 176). Once inside, go through the beer garden and head left. You'll find us in courtyard 4, building 6. Take the S-Bahn to Alexanderplatz. Change to the U2 subway line in the Pankow direction. Get out at Senefelderplatz (two stops) and take the SaarbrÃ¼cker StraÃŸe exit. Cross the street and climb the stairs to Pfefferberg (SchÃ¶nhauser Allee 176). Once inside, go through the beer garden and head left. You'll find us in courtyard 4, building 6. Take the U2 in the Pankow direction. Get out at Senefelderplatz (20 stops) and take the SaarbrÃ¼cker StraÃŸe exit. Cross the street and climb the stairs to Pfefferberg (SchÃ¶nhauser Allee 176). Once inside, go through the beer garden and head left. You?ll find us in courtyard 4, building 6.